Governor calls for $600 million in school funding over five years – Welcome to Wyandotte Daily! This evening, Gov. Sam Brownback recommended $600 million in additional funding for Kansas public schools, to be spread over five years. In his State of the State speech, the governor also recommended that legislators pass a constitutional amendment on school finance that would prevent future court battles. “The people of Kansas expect results,” Gov. Brownback said. Gov. 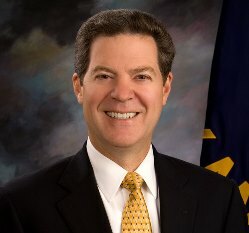 Brownback said the state would expect schools to meet a 95 percent graduation rate, with a minimum of 75 percent of the students continuing their education after high school by going to college, receiving certification or joining the military. There was no extra funding source identified tonight, but the governor said taxes would not increase to pay for the funding. In his State of the State speech, the governor also mentioned the American Royal moving to Kansas and the new National Soccer Training Center, both in Kansas City, Kansas. The governor listed a number of his dreams in the speech, including some that involve Kansas City, Kansas. The Kansas City, Kansas, Public Schools was one of the districts that led the effort for more funding for the public schools. The state was ordered by the Kansas Supreme Court to adequately fund public schools by April of this year. David A. Smith, the spokesman for the Kansas City, Kansas, Public Schools, tonight said his first reaction to the governor’s announcement of $600 million in funding was that he was pleased the governor was responding to the court, and he thought it was a positive sign. The district will be waiting to see what the Legislature will do this year, he added. It will be up to the court to decide whether five years is too long. Rep. Jim Ward, a Democrat from Wichita, a candidate for governor, and the leader of House Democrats, presented a Democratic response to the governor’s message. A coalition of Democrats and moderate Republicans voted to repeal Brownback’s tax experiment last year, he said, and when Brownback vetoed it, the Legislature overrode it. The Kansas credit rating was upgraded after the override, he said. The Legislature invested $293 million in new money to Kansas public schools, increased funding to the mental health safety net, teachers received pay raises, as well as state workers. “The progress of last year is at risk, there is a danger of the Legislature falling back into traditional partisanship that originally got us into this mess,” he said. Rep. Ward said he would take a bipartisan approach and is willing to partner with anyone that would join them for common-sense solutions. “Each and every child in Kansas deserves a chance to pursue their God-given talents, regardless of where they live,” Rep. Ward said. Strengthening the economy, maintaining fiscal responsibility, and working to create more good jobs is the challenge they must meet, he said. More of Rep. Ward’s remarks are online at https://www.facebook.com/KansasDems. “After seven long years of damage caused by the Brownback Administration, Kansas faces significant challenges. We have the opportunity this year to start investing in our future again – our schools, roads, and communities – and get our economy moving again,” Sen. Kelly said. “The Legislature has a long list of priorities to address this session, but schools are the most urgent. The Kansas Supreme Court gave us a deadline. We must work fast to meet that deadline. It’s time we stop the games and do our job. And to do that we must have a multi-year plan that makes sure all children – no matter where they live – get the great education they deserve. Mr. Speaker, Madam President, Members of the Kansas Supreme Court, Legislators, Cabinet Members, friends all. Let me start with the elephant in the room. There’s a question that has been often asked this past year and it’s a legitimate one. Will he be back? I’m pleased to say tonight — YES! Bill Snyder will be back. He’s here with us tonight. Please join me in recognizing the greatest coach in college football history. Bill Snyder is more than a Coach, he is also a mentor and Chairman of the Kansas Mentoring Council. We honor his mentoring work. It should inspire us all to follow his lead. 2017 was a very exciting year for our beloved Kansas. We hit another record for most Kansans ever employed, 1.4 million , and the lowest unemployment rate we’ve seen since 2000. We opened the longest hiking and biking trail in the state, the Flint Hills Nature Trail, from Herington to Osawatomie, 117 miles of beautiful Kansas. Go try it. In 2016, Kansas was the only state in the nation to reduce its rate of adult obesity. The rate is still too high but moved in the right direction. Our state’s childhood poverty rate has shrunk to the lowest level we’ve seen since before the Great Recession. Our infant mortality rate sits at the lowest point in history. We opened a new state of the art medical education building at KU Med that will give us the opportunity to educate an additional 50 doctors each year. We opened the biggest milk drying facility in the US in Garden City, providing us with a great way to export our growing milk production. The American Royal is moving to Kansas. This past year also saw the completion of the new National Soccer Training Center in Kansas City. Our quail population is back, with the highest levels in 20 years. And our wind energy industry continues to grow dramatically with nearly 30 percent of our electricity now coming from the wind. Now I have been blessed with the opportunity to travel this state from border to border in various capacities since 1974; when I was elected State President of the Future Farmers of America and me and my Ford F100 3 on the tree pickup started traveling the back roads of Kansas. Our state is a marvelous place full of beauty and wonder. Our sky is our mountain and our sunsets bear the signature of God. To those who can see it, Kansas is truly amazing. Now no one ever goes alone on a successful long journey and certainly I have not. My wife Mary and I have traveled this course together. Would you please join me in recognizing our incredible first lady for her contributions to Kansas? Family has been there too. My parents, Bob and Nancy, are stooped and gray but still chugging along. Our children have added spice and joy and now three grandchildren. Joining us in the balcony this evening are Major General Joseph Martin and Command Sergeant Major Joseph Cornelison from the 1st Infantry Division at Fort Riley. Please join me in recognizing them. Would our veterans and current active duty, guard and reservists also please stand and be recognized? Kansas first responders were quick to answer the call to help our brothers and sisters in Texas in the aftermath of Hurricane Harvey. Over 50 personnel from Kansas went to join the recovery effort. Two of these selfless Kansans are with us today, Paramedic Landon Woodward and Firefighter Chris Stansbury. Please join me in recognizing them. Topeka Police Officer Aaron Bulmer is also with us this evening. Officer Bulmer saved a 4-year-old child with autism from drowning in a pond last year. When asked about his heroic act, he said “I believe that God put me into that situation. He allowed me to be in the right place at the right time.” Please join me in recognizing him as well. Would any other current or former first responders from law enforcement, firefighters, or paramedics also please stand and be recognized? Cortney Holloway, Mike Dettmer and Robert Adcock from the Department of Revenue are also here today. In September Cortney was shot while doing his job in Wichita. He didn’t panic, but he did pray. Rather than run, Robert and Mike quickly jumped into action to aid their injured coworker. They applied a tourniquet and kept Cortney alert until emergency services arrived. Please join me in recognizing Cortney Holloway, Robert and Mike for their inspiring and heroic actions that day. I’ve had many good friends for the journey, as you have. Friends closer than a brother riding with me at a full gallop across the prairie. And finally, I have been blessed with a staff so loyal they have gladly taken the slings and arrows cast my way. I will be forever grateful for the contributions and dedication they have brought to this office. We all have great staff, let’s thank them for making this place work. With all of this, I am the most blessed man I know. Traveling this state so many years, you meet lots of wonderful people with great stories. Two individuals stand out. Rose Harris was 101 when I met her in Pittsburg, Kansas. Raised in a very poor family, she thrived through it all with uncommon faith and beauty. I asked her the biggest lesson she had learned in life. Without hesitation, she said it was when she was a young girl and her Dad went off to work in the mines. She was left in charge of the house and younger children. They were all hungry but had no food. So, Rose went to the outhouse and prayed… “God, we need food!” She came back into the house and a neighbor lady was at the door. She asked if Rose would churn her milk into butter. Rose said she would and she did. The neighbor gave her some of the butter and a few coins for her work. With the money, Rose went to the store and bought a few pieces of meat and they had food. Rose said from then on, she always knew God would provide for them. Certainly, our material wealth had progressed in his lifetime but has our happiness kept pace? It’s a good question for us as policy makers to ponder. So, on this, my last State of the State message, I will speak from my heart about dreams I have heard from others and have had myself for our wonderful state. As a dad, I know that every parent’s greatest dream is for their children to grow, learn, and succeed. So, let me address the biggest issue of the session, school finance. We have received the decree of the Kansas Supreme Court and are putting forth a proposal to comply, as we have done with the prior decisions. My budget recommendation includes an additional six-hundred million dollars in funding over the next five years. This multi-year approach will provide the time necessary for school districts to plan and spend this additional money more effectively. My proposal does not include a tax increase. First, we should reach a 95% statewide graduation rate. Second, a minimum of 75% of our students should be continuing their education after graduation, whether that be through attending college, earning a post-secondary certification or joining the military. Third, we should accelerate the movement of Kansas schools to the Kansans Can model for school redesign launched by the Kansas Department of Education. First, Kansas has great teachers. We should have a higher average teacher pay than any of our surrounding states. Second, we should increase the number of school counselors and school psychologists in Kansas schools by 150 positions each year. Third, we should have at least 50 schools participating in the Kansans Can school redesign project. Fourth, every Kansas high school should offer at least 15 credit hours of dual credit coursework to every high school student, at no additional cost to parents. This, through a partnership between high schools and the state’s institutions of higher learning. Fifth, they should also offer every Kansas high school student, at no additional cost to parents, the choice of taking either the ACT college entrance exam or the Work Keys assessment. These goals should be achieved within the next 5 school years. Six-hundred million dollars is a very significant investment. And Kansans expect to see students in every school in our state thrive and achieve, particularly our students who the Court cited as being inadequately served under our current funding. We cannot – we must not – repeat the mistakes of others who have gone down the primrose path of thinking that educational results can be forced by massive infusions of taxpayer money alone. Money by itself will not solve the problem. For the best illustration of this, one need look no further than the Kansas City, Missouri school district, sometimes called America’s most costly educational failure. Federal courts supercharged the district with nearly $2 billion in a little more than a decade. When it was all spent, there was little to show in academic improvement – test scores were stagnant, achievement gaps remained, and the dropout rate actually went up. We must learn from this history. Additionally, we must stop the never-ending cycle of litigation on school finance. I urge the legislature to put a Constitutional amendment on the ballot this year addressing our school finance system. The people need to be heard on this central issue of state government. Kansas is a dreamer’s paradise. Our broad horizons tempt the mind to expansion. Our friendly people invite collaboration to accomplish a dream. A spoken word creates. An encouraging word produces encouragement; a negative word negativity. A dream spoken sets up the architecture for the creative efforts of free men and women to build upon. That is, if that dream captures their hopes for the future even if they can’t quite see it yet. Many of us remember the speech Ronald Reagan gave in front of the Brandenburg Gate where he stated the collective dream of those in the West: “Mr. Gorbachev, tear down this wall.” There were no bulldozers there ready to tear down the Berlin Wall, but its foundation crumbled that day. The spoken word created. So, let me speak of dreams for our state. My dream for Kansas is to be the best place in America to raise a family and grow a business. I dream of a Kansas whose population is growing faster than the national average because we have created such a dynamic environment. An environment that has many and diverse job opportunities. An environment with a great and affordable quality of life that calls people to Kansas. This will take time, bold effort and creativity but it is achievable. I dream of a Kansas where poverty is on the run; where jobs are plentiful, challenging and enjoyable; where wages and benefits are climbing. I dream that education in the state is tailored to each student’s needs and desires. So that that student has the maximum chance to succeed. That we have more educational options for each K-12 student like we do now for higher education students. I dream schools will be places of accomplishment, where students and parents choose to go: to learn, to achieve and to be challenged. They will be character-forming places that back up the family and produce a stronger person. Where patriotism flourishes, civic duty is instilled and all students achieve. Kansans dream of having the best cancer care. Everybody in this room has either been affected personally by cancer or knows someone who has been. One of our own, Representative Rich Proehl, has just come through cancer surgery and we wish him God’s speed in his recovery. I dream of leading the country in developing new treatments to heal old maladies using your own adult stem cells. Hips and knees for some but also your heart and mind. I dream of ending the shortage of rural physicians and dentists that has chronically plagued this state by producing our own dentists and more doctors. Lieutenant Governor Jeff Colyer is a man who has not only shaped health care policy in this state, but he has dedicated his life to the service of others as a doctor. Whether it is helping a disabled child in Kansas with a cleft palate or a malnourished refugee in places like Sudan, Rwanda, or Syria, my friend Jeff has served others in ways only dreamed about by many of us. Jeff, please stand. Let’s recognize his service to this state and our fellow man. I dream of a future Kansas exporting wind electricity across America. A Kansas known as the Renewable State. It could well be that in the future, those who have the wind resource will flourish like those who now have oil. We are growing as an energy state. Dream with me of an Ogallala Aquifer that never runs dry because the use is sustainable. Of our reservoirs dredged, renewed and supplying the water we need in times of severe drought. Of us having a legal, binding allotment of water from the Missouri River and of an Arkansas River with water in its whole course. These are possible. We can do it. Dream with me of a growing and diversifying Air Capitol of the World. With thousands of new jobs, the latest technology and a magnet for precision manufacturing. We will expand in commercial and general aviation. We will build air frames and engines and do extensive maintenance work. We will grow in defense and commercial aircraft manufacturing and drone technology. All the major aircraft manufacturers will have major operations here because Kansas leads the way in aviation! They will say, “If it flies, it must be from Wichita.” We can be an unmanned aerial vehicle hub, where the latest UAV technology is developed, tested and manufactured. We can be to unmanned aerial systems what we are now to general aviation. I dream that Kansas will continue to be and grow as a major financial services hub. That is happening now in Topeka and Johnson County. We have even more upside in this field. Dream with me of feeding the world. Meat and bread but we’ll expand our place at the table to include the milk you drink and the eggs you eat. Of moving up the value chain. So that the High Plains is known as the place where animal agriculture is done bigger and better than any place else. Agriculture businesses and cattle genetics will headquarter in Kansas City. Around the world of agriculture, Kansas City will be the capital. The dream for The Legends in Wyandotte County is for it to be a new Kansas City. If you know our state’s history, you know Kansas is where the fight to end slavery began. Now we have another chapter in that saga of man’s horrid treatment of each other. We will fight the scourge of human trafficking like no other state and throw that darkness from our borders. Attorney General Schmidt has been a champion in this fight. Let’s recognize his and the legislature’s efforts on this issue. I dream of reconciliation between the races. Where our problems aren’t ignored but addressed. Where people of goodwill view the past and the present with clear-eyed honesty and resolve to make things right. This is an honest discussion our country desperately needs. And finally, I dream of a culture of life where every life at every stage is celebrated and cherished. You have already done much to create this. With all the legislation protecting and honoring life you have passed, there have been 17,000 fewer abortions in the past six years than in the prior six-years. 17,000 we must not go back now! These are all dreams for Kansas. If they capture any of your own sense for our future, then let us band together, Democrat and Republican, to make them so. It will be a blessing to the people who are so weary of political jousting and just want to see something done. What say ye? A journey together with a friend is a thing of beauty. Let me end with a story about one of your former colleagues, Jan Pauls, a friend of mine on the journey. Jan served in this body for over 20 years with distinction and grace. An able legislator with her husband Ron always at her side. She never lost sight of her values and what was important to her. She lost her last election when she wouldn’t compromise her values and less than a year later she lost her life. Jan’s funeral was a celebration of a warrior gone to her eternal rest…. loved and beloved. Her life was well lived for the God she served. I had seen her alive in a hospital bed three weeks earlier. Gone were the earthly worries that so easily distract us. She was at peace. Can any of us ask for any more? Less than a month after Jan’s passing, her replacement in the legislature Patsy Terrell also passed away unexpectedly. May we have a moment of silence for both of them. What a striking reminder that life is fleeting. That we must set our sights to fulfilling our purpose without delay. Every day we live in these bodies is important. It is a reminder to live with purpose and to walk in love and service with our brothers and sisters. Here in Kansas, that is our way of life. Because of our good people, this good land called Kansas and the blessings of God, I can report to you that the state of our State is indeed strong and promising.